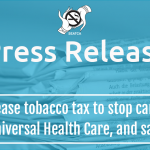 (Manila, Philippines – April 23, 2018) HealthJustice Philippines and the Southeast Asia Tobacco Control Alliance (SEATCA) accused tobacco companies of fear mongering with claims that further increases in excise taxes on tobacco products will increase or worsen smuggling. Global evidence shows clearly that raising tobacco taxes saves lives and can be implemented without resulting in more smuggling. 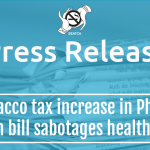 The Philippine Sin Tax Reform implemented since 2013 that increased taxes on tobacco products resulted in about 1.1 million Filipino smokers quitting as reported in the 2015 Global Adult Tobacco Survey (GATS), while bringing in from 2013 to 2016 210 billion pesos in incremental revenues used in different health programs of the Department of Health. According to Bureau of Internal Revenue Commissioner Caesar R. Dulay, the tobacco companies complained about the “proliferation of smuggling” following the effectivity of the Tax Reform for Acceleration and Inclusion (TRAIN) Act, despite the fact that the tax increase imposed was only PHP 2.50 per pack or 12.5 centavos per stick. A study conducted by the World Health Organization in over 75 countries shows that there is no direct correlation between tobacco tax rates and smuggling. While higher prices may provide an incentive to engage in illicit trade, other significant factors enabling illicit trade are weak governance and corruption, lack of political commitment, ineffective tax administration, and complicity of cigarette manufacturers. “A false argument often used by the tobacco industry against tobacco tax increases is the threat of illicit trade. International experience proves this argument is flawed. Illicit trade is much lower in high-income countries with high tobacco taxes and prices than in low-income countries with low tobacco taxes and prices,” said Dr. Ulysses Dorotheo, FCTC Program Director of SEATCA. “Tobacco companies simply want to keep cigarettes cheap and affordable to children and the poor,” Dorotheo added. “Lawmakers need to have the courage to do the right thing to protect public health and our youth: raise tobacco taxes to reduce affordability, and strengthen the government to effectively enforce anti-smuggling measures,” said Mary Ann Fernandez Mendoza, President of HealthJustice. “Smuggling is not a problem unique to the cigarette business. It isn’t logical to argue that higher tobacco taxes leads to smuggling without accepting that all sorts of taxes will do the same. But the health benefits of tobacco tax, which has already saved thousands of Filipino lives, far outweigh whatever temporary imperfection,” Mendoza added. Smoking kills at least 10 Filipinos every hour. HealthJustice with legal expertise in tobacco control and health promotion. It is a Bloomberg Awardee for Global Tobacco Control and a member of the NCD Alliance, an international network of organizations, experts and advocates working to reduce the burden of non-communicable diseases worldwide. SEATCA is a multi-sectoral non-governmental alliance promoting health and saving lives by assisting ASEAN countries to accelerate and effectively implement the evidence-based tobacco control measures contained in the WHO FCTC. Acknowledged by governments, academic institutions, and civil society for its advancement of tobacco control movements in Southeast Asia, the WHO bestowed on SEATCA the World No Tobacco Day Award in 2004 and the WHO Director-General’s Special Recognition Award in 2014.